UPDATE: Nabooti is for Members only. 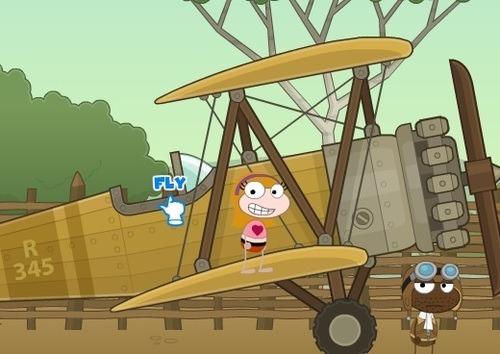 First enter Nabooti Island via the Poptropica Blimp. Once there, turn to your left and go inside the Nabooti African Museum in the tree. Inside there are lots of monuments of tribes from Africa. Walk to your left, fall down then walk to your right until you see the Nabooti Monument. Talk to the girl standing left of the statue. She will tell you the story of the five missing jewels. When she asks you if you would like to find the jewels, click ‘Yes! I’m in’. She will hand you a Map of Africa. Venture your way outside and walk to your left until you see a plane. Click on the seat. It should say ‘FLY’. It should now bring up a map of Africa. Your mouse is now the plane. Fly your way over to the right until your reach a point called Mountains of the Moon. Click on it or place your plane on the dot. Beware of the goats and falling boulders at this place. Run to your left and jump over the goats. Go through the water and jump over the next goat. Keep going until you’re at the end. Stop. Let the goat run at you and whack you up to the next ledge. Jump on the tree to your right, then again, then jump up onto the next ledge where the girl with blue headwear is. Talk to her, she will tell you she wants the red fig/cactus fruit that is above you. Jump on the boulder to your left, then jump at the Opuntia Fruit. You should be able to reach it. Go right, jump over the flowing water, and keep going until you reach the end. (Note: Boulders will crash on you if you stay in one spot.) Jump up onto the next ledge and then make a big jump over the goat and land on the ledge on the other side. Jump the small gap until you reach some icy slopes. Jump up the icy ledges (they are slippery), then right, then jump up on the ledges until you reach the old man. He will not let you in the cave unless you beat him in Mancala. Basically, the goal is to get the most stones into your big tray, which is on the right (the opponent’s tray is the other big one). 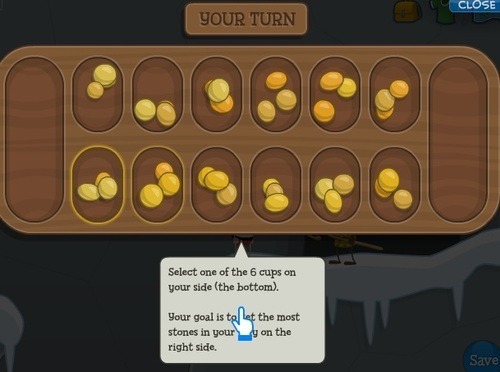 In each turn, you select a cup, and the stones inside of it will be dropped into the cups after it (one at a time) until all the stones from that cup have moved. If the last stone lands in your tray, you get to go again. If the last stone lands on an empty cup, you get to capture all the stones across from that cup into your tray. Once you win, enter the cave. Jump up the rocks until you’re on a rock that overhangs out from the main rock. Jump on the rock column right of you. Jump so you don’t hit the hanging icicles. They will hit you to the ground. Slide off this rock to the next. Jump up on the next column, slide onto the next one and then finally run off the edge to land on the ledge with the Red Jewel. Now fall down to the bottom and make your way out of the cave. Fall down to the bottom of the mountain and get in the plane again. Fly your plane North-East to a dot called Blue Nile Falls. Once there, jump onto your plane, then jump onto the grassy ledges, and jump up to the top of the cliff where there is a violet flower. It’s called the Egyptian Blue Lily. Walk over to it to pick it up. Go back down the cliff, go across the water until your reach some more grassy ledges. Follow the grassy ledges to the top to find a woman with a chicken, corn feed and a fox. Talk to her and ask if she needs your help. This should start a puzzle game. Bring the chicken to the other side. Bring the feed to the other side. Bring the chicken back to the other side. Bring the fox to the other side. Bring the chicken back to the other side to finish the problem. When completed, the women will tell you about the secret cave behind a bush to the right of the waterfall. Jump off to the right and try land on the ledge with the large bush. If you don’t, then jump up on the rocks till you get to it. Click on the large bush to reveal the secret cave. Now enter the opening. Once inside, jump onto the skinny column to your right. Keep jumping right. (Note: Do this fast because spikes will fall on you, if you fall just make your way to the left and start again.) 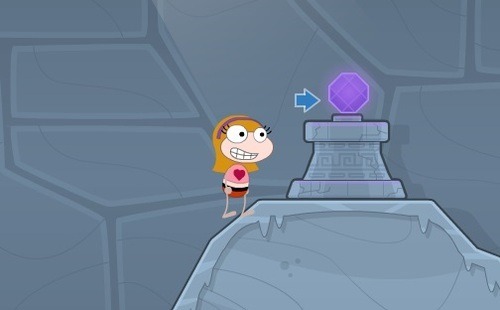 Once you reach the end, walk over and grab the Purple Jewel. Go back outside and make your way back to the plane. Fly your plane left, back to the dot named Nabooti. Once there walk right until you see a stall. Talk to the woman wearing orange clothes. 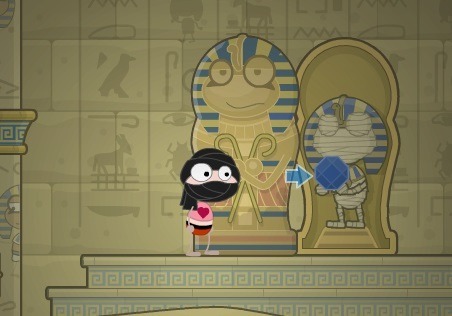 Trade your Egyptian Blue Lily for a Desert Turban. Now head back to the plane. Fly your plane north-east to a place called Giza. 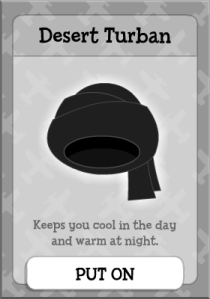 Once there, go to your Items and put on your desert turban. Go to your right and look for the tomb raider, who will hand you a Shovel. Once done, the man in front of you and his workers will have left. Click on the bag in front of you to take the Moon Stone. Now go left and then jump up on the Egyptian structure. Go to the top where a ring is. 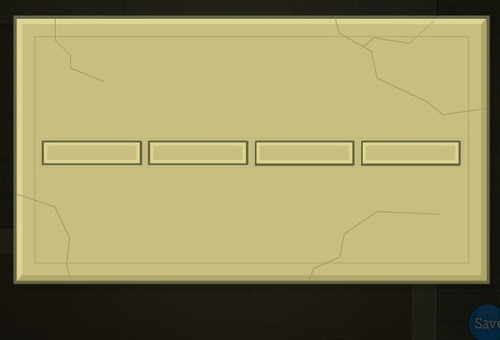 Go into your items and click ‘Use’ on the Moon Stone. It will open a passageway down below. Go down and enter it. Click on number 1 rectangle. Click on number 3 rectangle. Click on number 4 rectangle. Go right and jump up onto the platforms. Avoid the scorpion below the platforms! Keep going right until you see the next passageway. Go into it. Push block number 4 off and push it left until it is roundabout where the reset sign is. Push block number 1 off and push it to number 4. Push number 2 off but then push it so it is under the ledge. Push block number 3 of and align it with the others. Push the groups of blocks until it’s in front of the carvings on the wall. This should open up the next passageway. Jump up on the ledge and then jump left through the new opening. Jump on the block with a person. Jump on the block with an upturned boat and a jagged line. Jump on the block with a bird and a staff. Jump on the block with an eye and a boat. 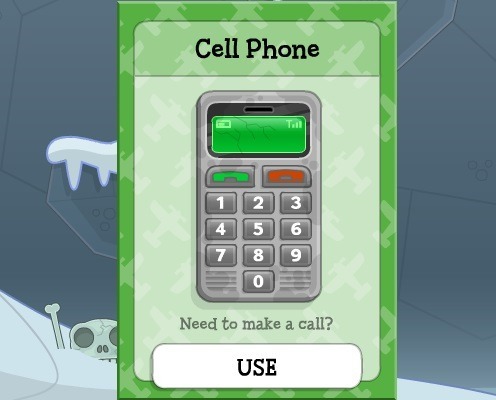 Once you have reached the top click on the rope to go up. Go up and enter a room with two large statues. In the middle of the room there is a tablet with markings on it. The dots on the cups tell you which switch to pull in what order. The switches are found on each column half way up. When a switch is pulled it will make a cup with a number of dots fall. As soon as you pull one, sand will start to fall and begin to rise. (Try the order 1-2-3-4 if the above combination doesn’t work.) Once complete, the mummy at the top will open to reveal the Blue Jewel. Grab the jewel and exit the room to your left. Climb down the rope then fall down to your right, then climb down another rope to your right. Now exit to your left. Make your way back to the plane. Fly south to Kaya Forests. Jump onto the hut, and jump right onto the trees. 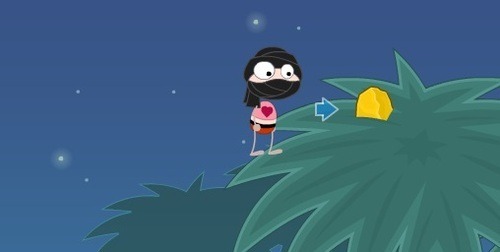 Keep going until you see a gold object in the tree. Pick it to get a Gold Nugget. Fall down and walk right until you see a giant shell. Stand next to it and go into your items. 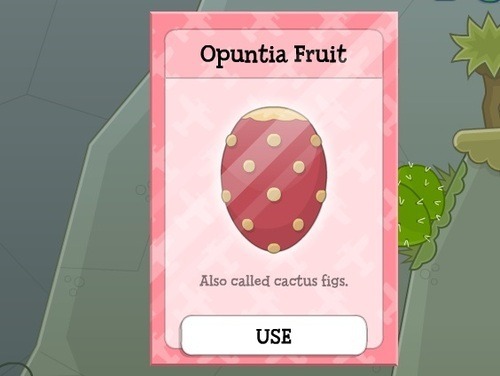 Click ‘Use’ on the Opuntia Fruit. The turtle/tortoise will wake up and move over to eat it. 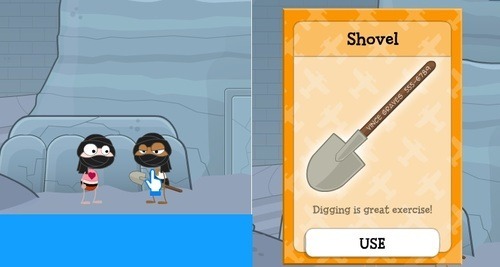 Walk over to the small hole in the ground, go to your items and click ‘Use’ on your shovel. 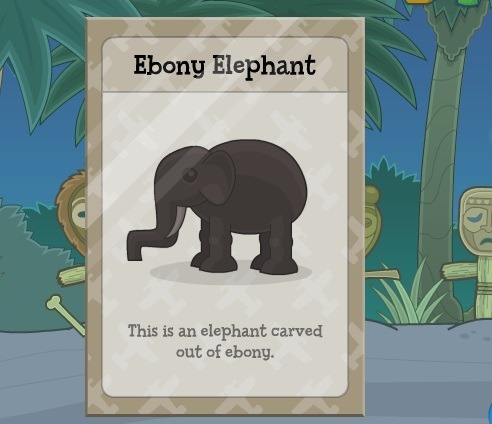 You will dig up an Ebony Elephant. Two mysterious ghosts will rise from the hole asking for a Fingo. Now go back to the plane. Fly north-west back to the Nabooti dot. Walk right to the stalls and talk to the girl wearing blue clothing. Trade your ebony elephant for a Fingo. While you’re here, walk right to the man wearing purple orange clothes. 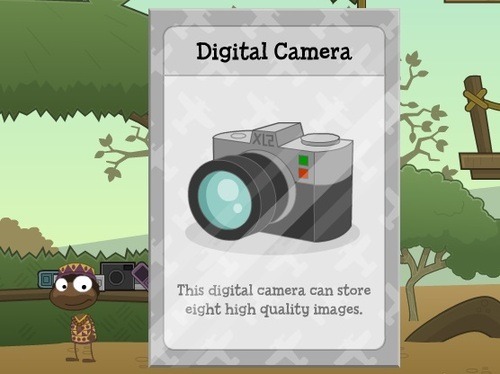 Trade your Gold Nugget for a Digital Camera. Now make your way back to the plane. Fly back to the Kaya Forests and talk to the ghost man again. Tell him that you have found the Fingo. As a reward he will give you a Green Jewel. Now walk back to the plane. Fly your plane just above you to Safari. Once there, run all the way right till you reach Big Zeke. Talk to him and ask if he needs help. He will tell you he needs 7 good pictures of different animals. There is a Giraffe in the middle next to the tree. Left of the Giraffe there is a Zebra next to a stream. Left of the Zebra there is a lion in the bushes. In the top left-left-hand corner a bird will appear in a tree. Right of the Giraffe an Alligator will emerge in the water. At the very right an Elephant will appear behind a mound. 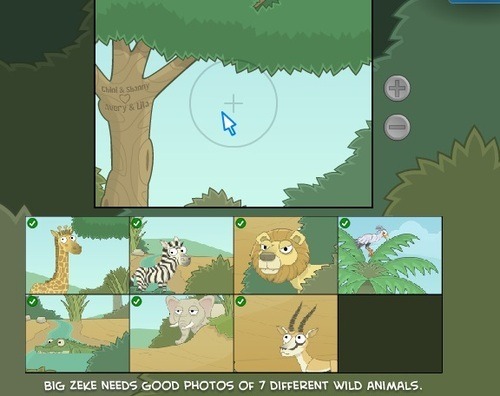 In the very bottom-right-hand corner a Gazelle will appear. 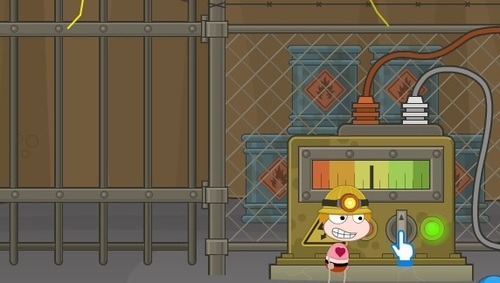 Once you have taken the 7 good photos, press close and Big Zeke will reward you with a Miner’s Hard Hat. Now head back to your plane. Fly south until you reach Diamond Mines. Once there, put on your Mining Hat. Go over the dirt mound, go right, and then pass the man and the electric fence until you reach a switch board. Click on the switch between the two lights. This will turn off the electric fence but only for a short time. Your time left will be shown in the bottom left-hand corner. Run left, go up the dirt mound, jump onto the metal structure, go along it and fall down the gap onto a ledge. Walk along this ledge until you see an opening in the fence. Enter it. If you do not make it in time, then go back and flick the switch again. Go left until you see some incoming mine carts. 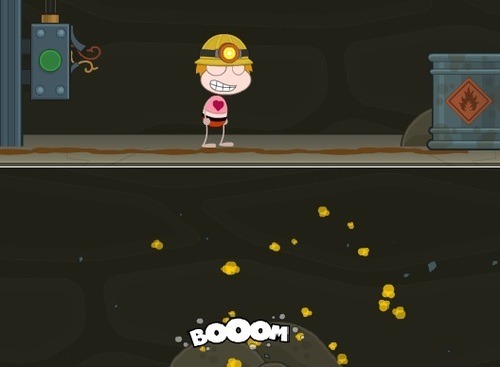 Stand underneath the railings until a mine cart falls off. Jump on and make your way up. Stop underneath the next railings and wait for the cart to fall. Jump up and run along. Repeat this process until you reach the top. Then enter where the mine carts came from. First click the green light to turn it off. Now push the flammable canister right until it stops at a rock. Go back to the green button and turn it on. This should ignite the oil trail left by the canister. When it reaches the canister, it should blow, destroying the rock in front of it. Turn off the green button again and push the canister to the very end. Go back and press the green button to ignite the oil. This should open up a new passageway. Enter it. 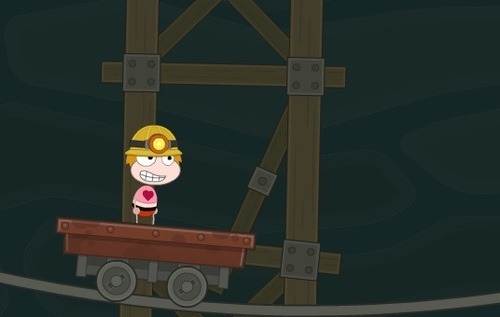 Go right and push the mine cart forward. This should start the mine cart ride. During the ride you need to jump over the spikes and duck when it’s at the top. Follow the instructions below to reach the end of the track. If you fall off, click Try Again. Bend down to avoid hitting your head at the top. Jump when its says jump near the bottom of the bend. Jump when you’re near the bottom again. Get ready to jump again. And then just let it finish. It should take you to the next room. Go right and jump on the platform via the bump in the wall. Jump up again until you are on the pile of diamonds. Click on the diamonds to view them. Click and hold onto the magnified glass in the right-hand corner. Move it to one of the gems to the left until you see a marking on one of them. 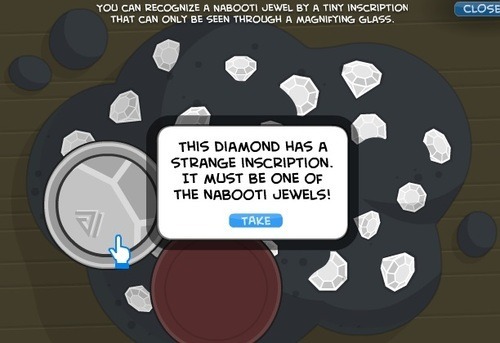 Hold it over the diamond until it asks if you want to take it. You will now have the last jewel, the White Jewel. Climb up the rope. Now go to the plane. Congratulations, you have finished Nabooti Island! 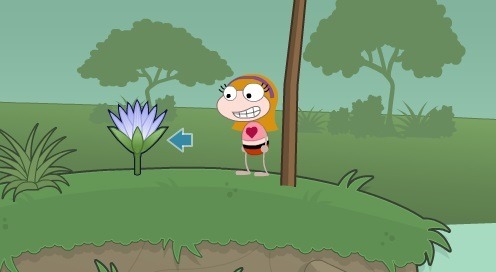 As a reward you will receive the Nabooti Island medallion and credits to spend at the Poptropica Store.